This is Unit #3 of a 4 unit condominium with a large pool in the backyard. Located on Gulf Drive, we are less than 100 steps to the beach. Unit 3 is an upstairs unit. Free WiFi. 25 steps to the beach. Public access is directly across from our front door. We are less that 100 steps to the beach. In addition, we are only about a “Nine Iron” east of Schooners…leave your car parked and walk back and forth. For fine dining, we are less than a mile from Capt Anderson’s and the Marina. There is no more convenient location than here. Enjoy the “drive-up” parking convenience without the hassle of the elevators and long walks. There is a convenient beach concession close by with jet ski’s, floats, etc. You can enjoy the blue/green waters of the Emerald Coast, sink your toes in the white sand and take in one of the most breathtaking sunsets of your life. We have all the amenities to make your stay most enjoyable. Come and enjoy your vacation with us. My name is Martin Overton. I am sort of retired. My background is in the food industry and the military We have been living in Panama City Beach for 10 years, and know the area fairly well. We believe that our property should add to your vacation enjoyment and not take away from it. You can see a small view of the Gulf through the public access walkway in front of the building. I'm pretty picky. I had one set of coworkers whose nickname for me was "diva." This spot suits me just fine. Mr. Overton is wonderful to work with, and his property is just what we needed. This unit has one beautiful, comfortable king bed in the room with the balcony. This room doesn't have an adjacent bath, but the full bath is between the bedrooms. The room with the queen bed has a 3/4 bath, and that bed is super comfortable, too. The kitchen is well-appointed and the washer and dryer worked great though the washer does make some strange squeaking noise, so we didn't run it at night. (I failed to mention that to Mr. Overton. I'm sure he'll repair it as soon as he he knows.) The pool area was beautiful and relaxing, and the water was super clean. Wifi worked great! We loved it. Super convenient! Quiet area. Everything you need! Loved Martin’s place. It was so convenient to the beach. Just make sure you get up early and reserve your beach spot. Space is limited due to two adjacent high rises. Martin was super responsive. Schooner’s is half a block away. Go get their frozen drinks and sip on the beach. Party there at night, stumble home. Great rental condo and great location. Owner is very helpful. Near restaurants & grocery stores. Would definitely stay her again! Close to everything that we liked to do. My wife and I with a dog arrived and was met at the condo by a pleasant caring landlord. The TV cable was down but he took care of it by the next morning. 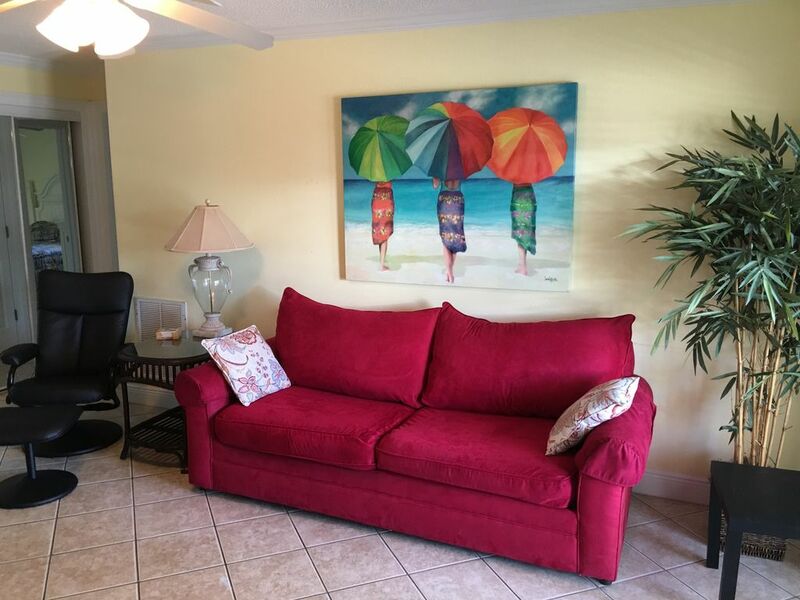 This condo was clean, newly remodeled and was ready to move in for vacation. Everything to do or shop was minutes away, and the beach was across the street. There was a place to eat not more then 500 feet away that served the best sea food. The other tenant in the building was great friends. I will return to this place in the future and I highly recommend it to have a great time. A Great vacation spot. We are located between the Grand Lagoon and The Gulf Of Mexicao. Deep sea fishing charter boats are within a 1/2 mile of our property. There are dozens of eating places within 1/2 mile. Contact me at 850-258-1038 Deposits: Weekly = $200, Monthly = $300 A pre-payment is required to reserve a unit Monthly rates only apply Nov - Feb Pet fee for monthly is $125 and for Weekly - $95.00 Pet Policy is located on our website at www.pc-vacation.com Monthly rates are based on the calendar month.